"Serenely self-indulgent, this collection of multi-million-selling, timeless American classics will soothe the soul of even the most tormented losers-in-love and those who haven't QUITE lost it yet! Carefully chosen for their all-encompassing hint of sadness, Jon's inimitable style once again perfectly captures the intimate-yet-Grand Piano style which so perfectly frames each melancholy gem. A light yet commanding touch; sensitive and timely expression - Jon plays each melody with love and care JUST as the original torch-singers who made them famous do. 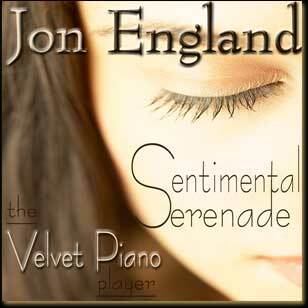 The "Velvet Piano" player has produced a set of recordings which are a thing of beauty and lasting significance ... not unlike the lost/losing/unrequited love about which these songs have been written and which will touch a nerve in all who hear them and who have a heart which isn't quite as unbreakable as the owner once thought.